Rhubarb, Rheum rhabarbarum, has been a failure in our garden. Or perhaps I should say we have failed Rheum rhabarbarum. After a very promising start when we grew six or eight plants from seed and watched them grow to maturity, we neglected to harvest any of the stalks and watched the plants die one by one for reasons we have never been able to determine. I have keen to try growing rhubarb again but am too ashamed to mention this desire to Richard. When I occasionally see rhubarb in our local greengrocer I sail past it without even thinking of buying it and making something delicious with it. Rhubarb, after all, should be grown in the garden and not bought packaged in miserable polystyrene punnets. However when I recently stumbled upon an enormous bunch of organic rhubarb in Haenertsberg in Limpopo I could not resist it. It was clear from the size of the bunch that there was far too much for just one dessert. What was I going to do with this rather large bunch of rhubarb? I can’t remember ever actually cooking rhubarb. I had liked the idea of cooking it, I had had little fantasies about walking down the garden path to pick the lovely pink stalks and making a tangy pie, but all I had done was kill the half dozen plants that were going to turn into potential pies. Naturally some online research was in order – and Google come up with the goods. The first recipe that caught my eye was for rhubarb posset. I adore lemon posset. Lemon posset has been a familiar food on our narrowboat trips since the year my daughter first made it when she was drawn to a Hugh Fearnley-Whittingstall recipe in The Guardian. I was aware that possets have been around for centuries although not quite in the form familiar to us denizens of the 21st century. I got a little sidetracked reading up on the history of possets, learning that possets were both enjoyed as a dessert and used medicinally. In the process I found myself reading more than just a few posts on this engaging blog, British Food: A History. Rhubarb it seems has even more ancient roots than medieval posset. It was also used medicinally although in this instance in Tibet – thousands of years ago. 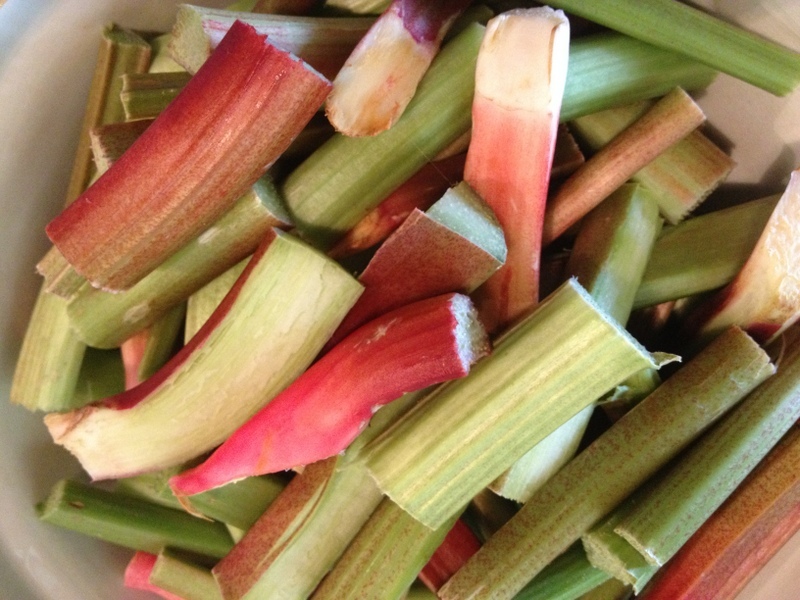 It was grown in China too, but according to James Beard in Beard on Food, Siberia gave us the more common variety of rhubarb that we know and grow. I was further sidetracked by the accounts of growing rhubarb in the Yorkshire rhubarb triangle. After spending a couple of hours in cyber space I realised time was ticking by so I put my mind to getting the rhubarb cooked. I was rather taken by a recipe for lamb cutlets cooked with rhubarb. We were planning to cook Gemsbok shanks that night and it seemed this very English lamb recipe was just begging to be translated into a hearty Limpopo supper particularly suited to a misty rainy day. We cooked the Gemsbok shanks for about six hours in a very low oven on a bed of chopped onions and rhubarb, flavoured with star anise and black pepper, with a generous splash of balsamic vinegar. At the same time, although not for the six hours allotted to the shanks, we roasted the balance of the rhubarb with castor sugar. In the end, it was hard for me to give up the idea of the posset. I wasn’t sure we had the right cream so we made a rhubarb fool by folding the baked, cooled rhubarb into whipped cream which we poured into long-stemmed glasses and refrigerated overnight. It made the most unexpected yet exquisite and festive breakfast. Just the thing for a Monday morning. Serendipity struck this week when I made the trip to the Hospice book shop to try to buy a book voucher for the winning writer of one of the Allaboutwriting 150 word writing challenges. 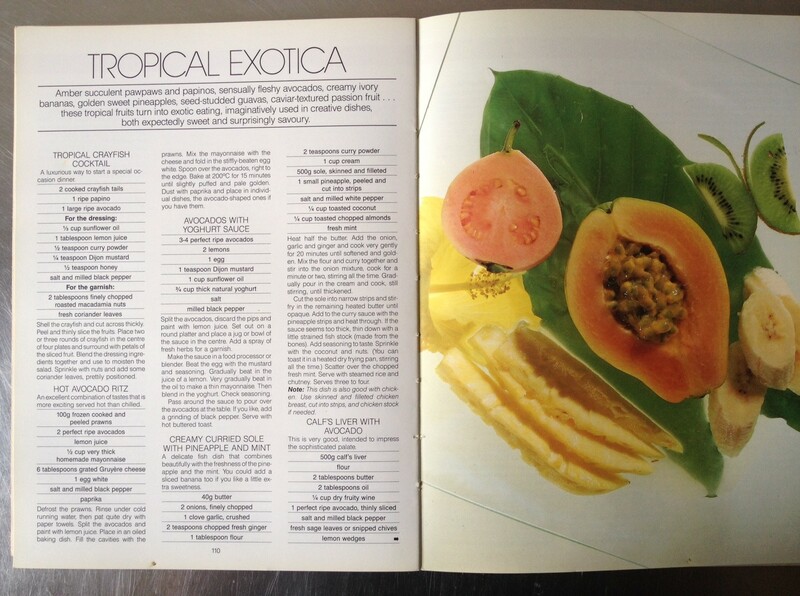 I have been dipping into my rather dog eared copy of The Cosmopolitan Cookbook by Phillippa Cheifitz quite often lately and it’s been pretty annoying to have to re-order the pages each time I’ve wanted to find a trusted old recipe. In fact I have been thinking of contacting the publishers to say ‘Why don’t you reprint this book since there are a couple of generations of cooks out there that would probably love to have it on their shelves?’. The recipes in the book, as well as on the torn-out magazine pages I have been hoarding, have been very much part of my cooking life for almost 30 years. The book, I believe, is a classic – delicious recipes, simple clean layout and stunning photographs. I have never been a ‘Cosmo’ kind of a girl but I used to buy the magazine every month without fail just for Phillippa Cheifitz’s recipes. 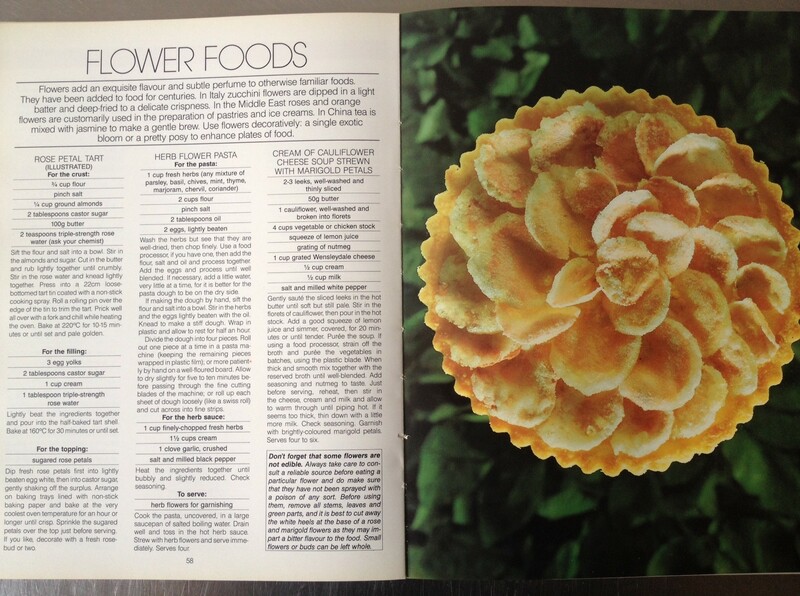 As Jane Raphaely, the publisher, says in her forward, ‘We don’t live to eat – we love to eat and the results are the most delectable food ever featured in a magazine. Our secret ingredient is the cook.’ She was right. Having been unlucky with the purchase of the gift voucher I thought I’d have a quick look at the cooking section and was bowled over to find an unused copy of The Cosmopolitan Cookbook. 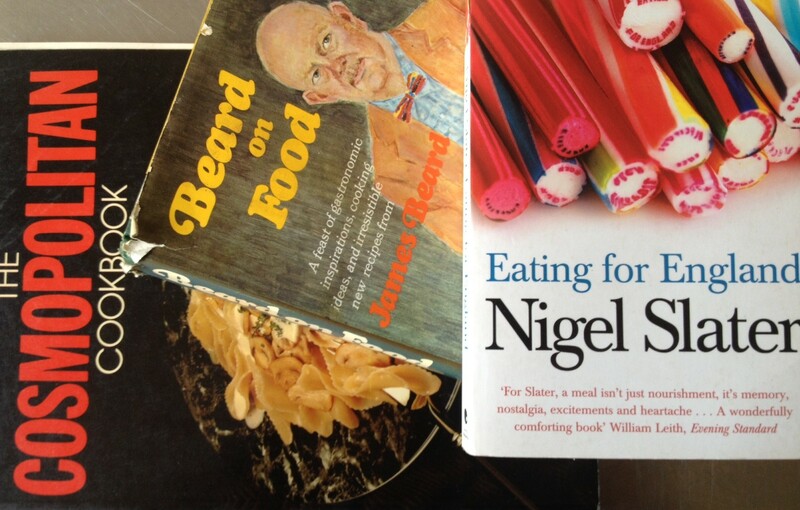 Naturally I snapped it up immediately along with Nigel Slater’s Eating for England and James Beard’s Beard on Food. All three for the very reasonable price of R55. 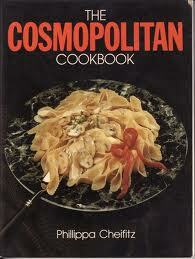 So what are my top ten recipes from The Cosmopolitan Cookbook? I have to start with the Homemade Pasta recipe which, along with a pasta machine I received as a wedding present, inspired me to make my own pasta for many years. Caviar and Cream Sauce to serve with pasta. You’d be hard pressed to lay your hands on a more luxurious yet quick-and-easy recipe. It even found its way onto my hiking foods menu when my younger sister and I made it on day one of the eight day 120km Namib Naukluft hiking trail. The pop of the caviar (actually Danish lumpfish roe) in your mouth, with the acidy lemon, silky creamy pasta and spicy black pepper is just about as perfect a combination of flavours and textures as can be imagined. I’ll sneak in the Fresh Tomato and Anchovy Sauce here too. This incredibly flavoursome sauce once eaten at dinner parties by my friends and me now finds its way into school lunch boxes. The Mexican recipes – Guacamole, Tortillas, Chilli Con Carne, Salsa and Frozen Margarita – have been made to death and in great quantities over the years and served on all occasions from tequila-fuelled dinner parties to school night suppers. These days, though, Woolworths is part of the process with their pre-packaged tortillas. Good or bad? I’m not sure. Rose Petal Tart, so beautiful and perfect, was made by a friend for my wedding. I must make that again! The Strawberry Tart is also beautiful and perfect. Janssen’s Temptation – served with a green salad for the most perfect week-night supper. Fig and Ricotta Mould – a staple of my younger sister’s repertoire and a perfect way to end any meal. Tropical Crayfish Cocktail. An exquisite combination of avo, papino and shellfish with a lightly curried dressing topped with crunchy nuts and fresh coriander first made by my older sister but now a firm family favourite. The dressing is delicious and I use it all the time on a variety of salads, most recently on a chicken and prickly pear salad. Croquembouche – the spectacular French dessert I once made for a friend’s wedding. Although we filled the profiteroles with chocolate mousse and not custard. The Baked Orange Chicken has been a thirty year stalwart, present from carefree single days through to family weekday suppers. The fillet recipes with both green and black peppercorns and the various mushroom sauce recipes are the inspiration for many a steak supper. That’s my top ten from the book and if I had to go through the magazine clippings the list could easily treble. I’ll leave that for another day. It is a little worrying though that this list is very weddingy. What is this – a Cosmo girl kind of a thing? Oops, well maybe it’s not so bad to be a Cosmo girl after all. P.S – If you are tempted to buy the book – just Google it – there are a number of copies available online. and for tons of Phillippa Cheifitz’s more recent recipes have a look at Woolworths Taste magazine.